Discussion We just merged a custom emoji set by @Todd into core and I'm totally in love with it. 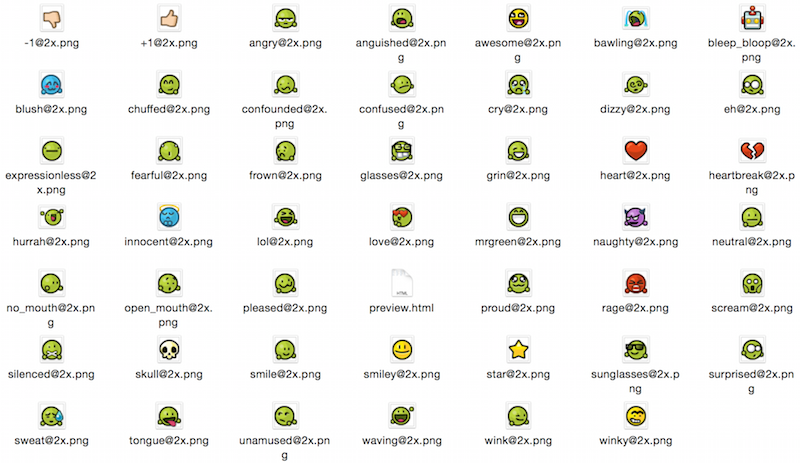 We just merged a custom emoji set by @Todd into core and I'm totally in love with it. They are called "Little" and will be coming to this site immediately upon release, probably in less than 24 hours of me posting this. They're very retro. Our emoji support just got awesome, and we're going to be releasing an "extender" plugin for making your own emoji sets super easily. Stay tuned! Is there a stick waving emoji? Oh yeah! I love smileys with "hands"
Took me a while to figure out how to add them since the advanced editor only shows 12 of them. • Emoji refers to a specific characterset which originated in Japan and is now mapped onto the Unicode standard. Emoji characters are now supported in many operating systems, after initial support on phones. • Emoticons refers to generic use of characters made up of punctuation and other letters and their graphical display. Vanilla has no Emoji support. I'm just tried typing in Emoji here, and they don't work. Vanilla does have custom Emoticon support, as seen in this thread. Support for multi-chromatic fonts is not universal, so in the end its substitution for a picture often. So really the only difference is what is used to substitute the characters. Emotions are great in the right context, but sometimes on a support forum it can clash. It kind of lowers the tone. @x00 I dunno, you might get more sympathy with adorable emoticons. It is more the emotional maturity that I worry about. it is maybe 1 in 10 people. But you when get one you really one, all emotions and little feedback. if it were me probably they would get a warning, and then banned if they continue. It is more the emotional maturity that I worry about. Me too. I will let you know when I've found some. We had a true nerd debate internally today over this. I took this position. @Todd and @initvector took the "emoji can be a generic term" stance with Todd going so far as to say emoticon explicitly means non-images, e.g. :-). @Tim and @beckyvb abstained from the nerdery, and thus the day was lost. I helped by providing witty images and useless meta commentary. So by "extender" I presume you could extend it yourself, with your own patterns or even with character sets. Fun stuff. I'm having the same debate with other moose here. Interestingly, the Unicode consortium calls their Emoji characters Emoticons.